Nest started by making thermostats, but following a Google acquisition and some reshuffling, it makes plenty of other smart home products. Having devoured Dropcam, Nest is one of the leaders in home security cameras with products like the Nest Cam and smarter Cam IQ. It had a "regular" outdoor camera previously, but now you can get an outdoor version of the IQ. The Nest Cam IQ Outdoor packs a 4K image sensor, a wide field-of-view, facial recognition, and incredibly sharp video. It's also one of the most robust outdoor cameras when it comes to tolerating cold weather. The camera is fantastic overall with high-quality video and a solid app. Although, installation was a bit confusing. 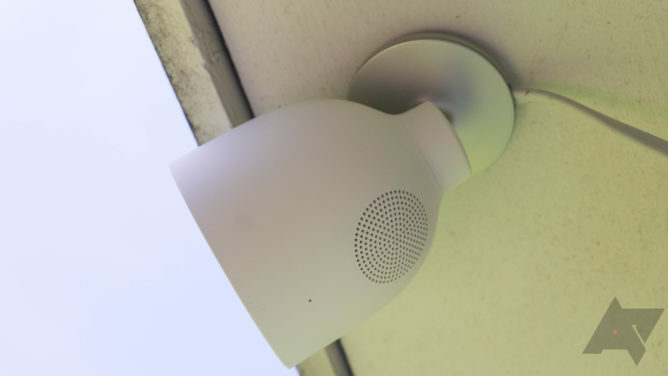 As good as the Cam IQ Outdoor is, there are still some annoying problems with motion detection, and the $350 price tag is way too high for anyone who's not already deep into the Nest ecosystem. Cloud storage $5 monthly for 5 days, $10 for 10 days, $30 for 30 days. No free storage. Video and audio The Cam IQ Outdoor has best-in-class video and audio quality. Daytime HDR helps on sunny days, and the night vision has good range. Minimal delay in the stream. Design The camera housing looks clean and it locks tightly on the base plate. The rotating neck and extra long Type-C cable are appreciated. Facial recognition The Cam IQ Outdoor is great at identifying faces and telling you who they are. App The Nest app ties together all your Nest products in one place. It's better than most other camera and smart home apps, too. Notifications The animated notifications are incredibly useful. Price At $350, this probably won't attract new users to the Nest ecosystem. A Nest Aware subscription is also needed for almost all functionality. App again The default Spaces layout is clunky when you have more than a couple of devices. You can't manage camera zones from the app. Installation quirks The included instructions were a bit light on details. Some aspects are not obvious as you're mounting the camera. Event detection The camera spots even minor things like headlights sweeping across the yard as an event worthy of saving. The Cam IQ Outdoor looks very similar to the indoor variant at a glance, but there are a number of important design tweaks. For one, the base doesn't have the same long neck as the indoor IQ. It's intended to mount to a wall or roof eaves. To install the camera, you start by mounting the base plate in the desired location. 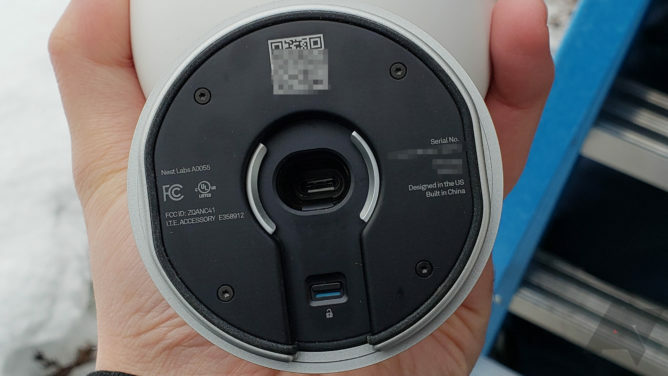 The camera comes with a long 25-foot USB Type-C cable, which is nice to see. I don't care so much that it's Type-C (I don't plan to unplug it often) but I do like the provided length. The cable can either pass through the middle of the base or come in from one side. The way you run it will depend on whether you're going to drill a hole for it directly under the base plate. The Type-C port on the camera is recessed deep in the neck, and there's a locking tab that keeps it in place. I was initially perplexed by a foam insert on the base that the included instructions did not mention. The camera snaps into the plate and locks in place, but the foam took up too much space—I couldn't tell if it was supposed to be removed. It took a lot of doing to peel it off, but it turns out I made the right call. Before you attach the camera, you need to scan the QR code on the bottom to connect it to your Nest app. The app does an excellent job of walking you through the basic logistics so you don't accidentally mount the camera before adding it to your account. My next speedbump came when testing the video after scanning the code. It was upside down, but the app didn't have the option to flip the signal like the indoor IQ. I was worried I'd have to take it down and move the mounting bracket to a wall instead of the eave. However, Nest just didn't do the best job in the instructions of explaining the "fully articulating hinge." The Cam IQ Outdoor can tilt back and forth, up and down at the hinge. The camera body itself also rotates 360-degrees. This lets you rotate the video feed without changing any settings in the app, which is a cool design feature. I also like that the Cam IQ Outdoor is rated for operation down to -40 degrees F, which is substantially lower than other devices I've tested. The Cam IQ Outdoor is a nice-looking camera—it's probably the most attractive thing about my ugly old garage. This camera looks like a showerhead with a large, flat face complete with IR lights and visible LEDs that illuminate when you use the speaker. The speaker is on the underside of the camera, which is a better place for it than the back like it was on the indoor IQ. The Cam IQ Outdoor has a 4K image sensor, but you don't get 4K video out of it. Instead, Nest uses all those extra pixels to make digital zoom less terrible. The video feed is always 1080p and 30 frames per second, but you get more detail upon zooming. The live feed delay is short; no more than a second or two. More importantly, the feed loads in about two seconds. Thus, you can see what's happening before it's over. When the camera spots movement, it zooms in to give you a better look. You can also manually zoom the view and set the digital zoom. The camera then "enhances" the frame using all those extra pixels. Most cameras would be a blurry mess zoomed in, but you can still make out details with the Cam IQ Outdoor. When watching a clip in the Nest app, there's a thumbnail down in the corner that pops back to the full frame view. I'm bummed that close-up view isn't actually part of the saved video; it's only there when you watch an event in the app. Although, I suppose I understand why. When something is moving quickly, the zoom doesn't always pan quickly enough to keep up. This camera uses what Nest calls "Daytime HDR" to improve image quality. It uses multiple frame exposures to make the final image more even—highlights aren't blown out, and shadows are brighter. The picture looks crisper and more vibrant than other cameras I've tested. With a 130-degree field of view, I was concerned the camera would have too much distortion at the edges, but the fisheye effect is almost non-existent. At night, the Cam IQ Outdoor fully illuminates my backyard, which is around 25-feet from the camera to the house. Even with some brightly illuminated objects in the foreground, you can still see what's going on farther out. Nest's HDR feature only works during the day, apparently, but the dynamic range is still solid at night. The speaker is loud and clear, and the delay is minimal. The three-microphone array on the camera delivers understandable speech from the other side as well. The Cam IQ Outdoor plugs into the same Nest app where you can manage your thermostat, home security, and other cameras. If you're already committed to the Nest family of devices, this app has become extremely powerful over the last few years. It's also a bit cluttered once you add more than a few products. The default "Spaces" layout means you have to scroll up and down to see all your hardware, and there's no way to change the order of Spaces (like living room, front door, etc.) from the default alphabetical. I prefer the alternative layout that shows a single icon for each Nest device, although I wish the camera previews were a bit larger. When you load up the Cam IQ Outdoor in the app, you get the feed up top and a scrollable timeline at the bottom. Nest calls this "Sightline," and it's a clean, intuitive way to save video. 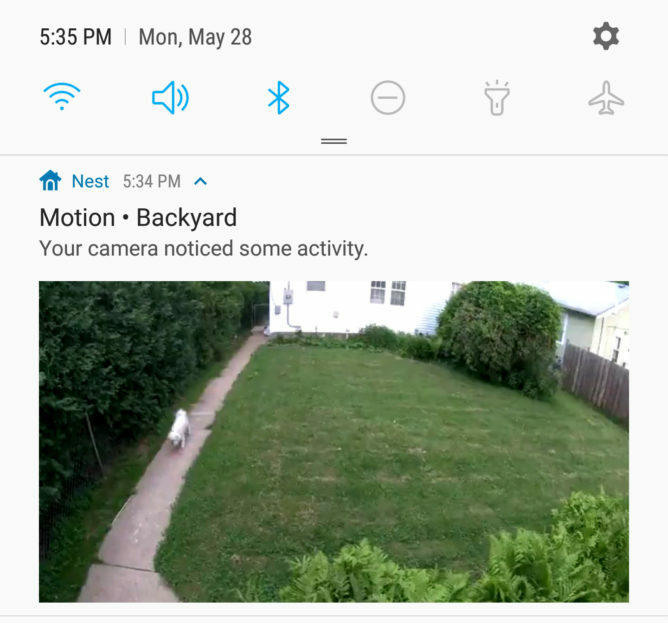 The camera records continuously if you've got Nest Aware (more on that later), so you can swipe to see older video even if there are no events shown. I like the way events are shown in the timeline, and there's also an event list view that makes it easier to track down a specific thing from your history. One of my primary complaints about this camera is how many of those events show up. The Cam IQ Outdoor detects motion from blowing plants, headlights passing across the yard, and rain. You can't turn down the sensitivity, but you can use zones to tell the camera where to watch for movement. Weirdly, you can only add these on the Nest website. I do appreciate that there's a full-featured web interface for Nest, but this is an important feature to leave out of the app. Since this is an "IQ" camera, it has the same face detection features as the indoor version. It shares the same facial recognition library, so it'll already know you if you've got an indoor IQ camera. As the camera spots new people, you can tell Nest you know them and add names. When they trigger a notification, Nest will include the name so you can tell what's up at a glance. Nest's notification implementation is my favorite right now, too. You can limit it to people or get pings for all movement. The push notification includes an animated GIF that will probably save you from opening the app much of the time. If you want email alerts, that's also an option. Nest, being part of Google, was the first to add Assistant features to its cameras. After plugging your Nest account into Assistant, you can name the camera (which is different than the Nest app name) and call up the footage by voice. For example, I stream video from the Cam IQ Outdoor to my living room TV (with "Show the backyard camera on living room TV") when I let the dog out. That way, I can see when he's ready to come back inside without needing to poke my head out the door. Unfortunately, Nest's cameras are still almost useless without a Nest Aware subscription. Most of the features I talked about above like zones, animated notifications, and even video history require a subscription. Without Nest Aware, your cameras don't save any video. All you get is the live feed and still images of events saved for a few hours. It's crazy not to include any free video storage when the hardware is already so expensive. Most companies offer at least a day of video retention. Nest has at least made its plans a little more affordable. The new 5-day option is $5 for a single camera and $3 for each camera after that. After a few confusing installation hiccups, this camera has been a fantastic addition to my security loadout. It's reliable and fast with best-in-class video, and it sports cool extras like facial recognition and a lower minimum operating temperature. The facial recognition isn't perfect, but I'm impressed by how accurate it is most of the time. Even when I'm not looking up at the camera, it still recognizes me. The Nest app is not free of bugs and annoyances, but it's one of the best home security apps on Android. Camera feeds load quickly, and you can carry on a conversation using 2-way talk from your phone. The most significant issue with this camera is simply how much it costs. You're looking at $350 for the hardware, and then you need to pay a monthly fee for it to be useful. 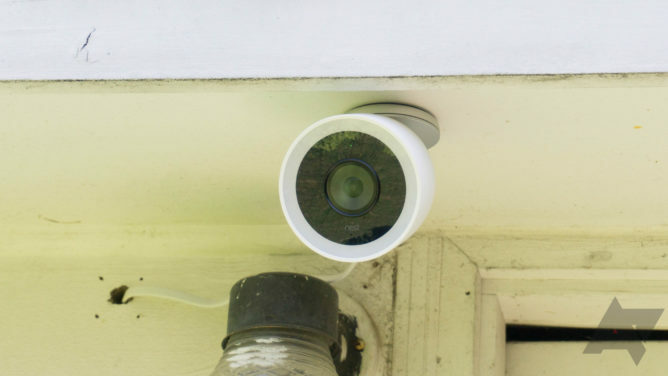 I can definitely see people with other Nest cameras dropping the money on the Cam IQ Outdoor. 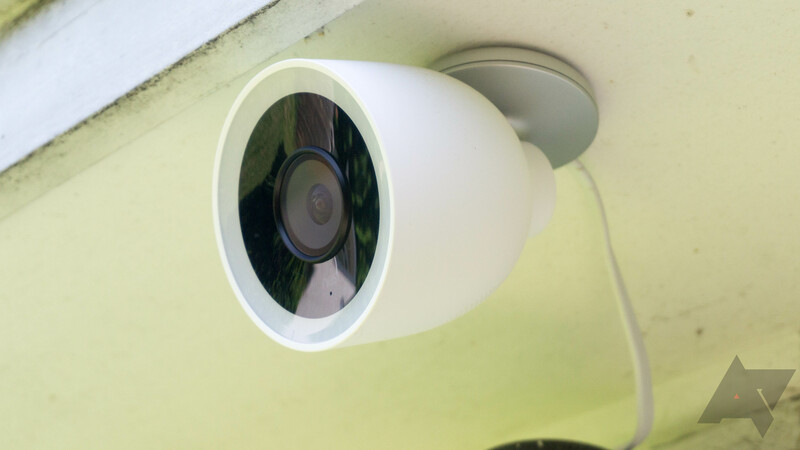 If you're not already committed to the Nest ecosystem, the Cam IQ Outdoor is too spendy.